Police would like to speak to the person pictured. 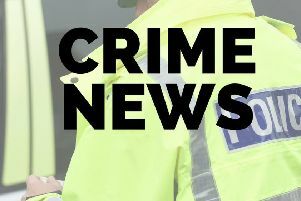 A person is wanted in connection to spray painting a number of trains in Daventry with the word "YOUT". Police would like to speak to the person pictured in connection with an incident of criminal damage and trespass at the DIRFT railway lines, near Kilsby. The incident happened at about 1.20am on August 26 when it’s believed the offender climbed over some metal fencing and walked along the railway track to where a number of goods trains were being kept in the sidings. The offender is described as white, about 6ft, and wearing a black North Face jacket, black skinny jeans and was carrying a lightweight North Face logo bag. Officers investigating the incident would like to speak to anyone who may have been in the area at the time, or who may recognise the person pictured. Northamptonshire Police are also reminding people of the dangers of walking along railway tracks, where there are "countless hazards" which could result in serious injury, including high voltage overhead lines and high speed trains.